This post began as a view on the developments in Cyprus, and I am grateful to Gail for the suggestion, and it is my fault that it morphed a little from that simple original objective. One of the problems that one faces in marketing natural gas is that there is so much of it coming onto the market that it makes it difficult to set a price for future production. Even when the fields and reserves are estimated to be large, having some confidence in the price that the gas will bring helps provide confidence, in turn, with investors that there will be a positive return on the cost of bring that gas to the market. However, once that initial commitment is made to invest the money, then the need for a return often drives an expeditious program to bring in revenue, even if the market is already reasonably well supplied. Prices may then fall, and the investment becomes a losing one. The current cold weather in the United Kingdom, and the threat of gas rationing has raised the price some 30% this month and the market appears lucrative. But the UK market, in the short term, can be rescued by 3 tankers of LNG from Qatar with more available if needed. (Provided it is ordered soon.) And then, though there remains a need to refill storage, the crisis will be over for now, and the price will likely fall back. (Although likely not completely since the UK is in process of shutting down coal-fired power stations to comply with EU edicts and natural gas is the replacement fuel of the moment.) Looking further down the road Centrica, a major energy supplier in the UK, has agreed to a 20-year agreement with a US supplier to buy LNG from the US (out of the Sabine Pass terminal). This would take a fifth LNG train, at a facility where the first train is expected to come on line in 2015, and the second in 2016. Each train has a liquefaction capacity of 4.5 million tons pa or 220 bcf of NG, and customers have already been found for the first four trains – again for a 20-year period. The UK supply is therefore not anticipated to start until 2018. In the meantime Qatar has no plans to increase production in the face of the overall growing glut in supply, although it potentially could. And this availability of alternate supply is not good news for the Big Daddy of natural gas exporters, those in Russia. Russia has already seen Turkmenistan sell its natural gas to China directly, rather than through Russian middlemen. To date this has reached 1.7 tcf with further expansion in the works. To make the situation more volatile the natural gas discoveries in the eastern end of the Mediterranean over the course of the last five years have been found to be of increasing size, as exploration continues. 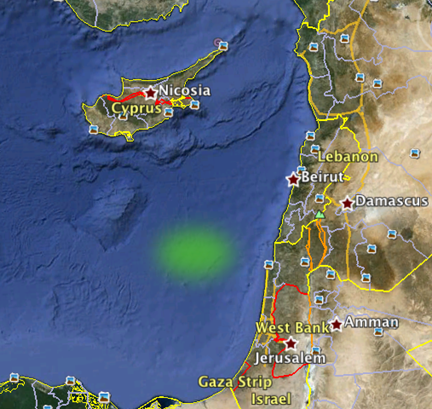 Three of these fields, Leviathan, Tamar and Dalit are in Israeli waters, while the fourth, Cyprus A, belongs to Cyprus. Figure 2. 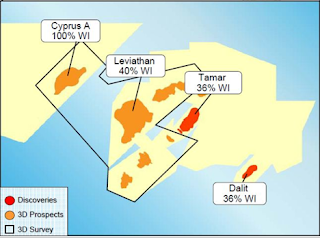 The location of the different fields that are being developed by Noble Energy in the Eastern Mediterranean. 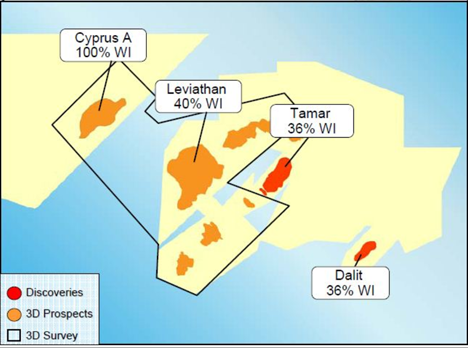 In terms of relative size, Cyprus A is at 7 tcf, Leviathan was initially projected at 17 tcf, Tamar at 9 tcf and Dalit is at 0.6 tcf. Since the original projection Leviathan has now been increased to 15 to 21 tcf, with a likely value of 18 tcf. 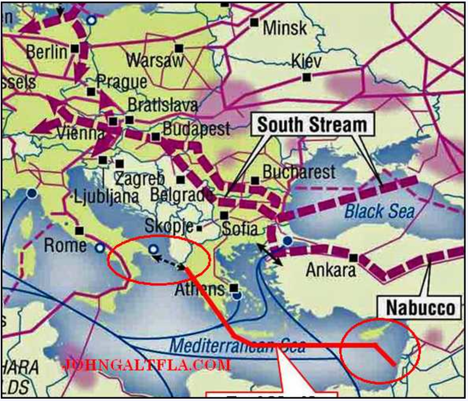 The Russian natural gas heavyweight, Gazprom has not been neglectful of these developments, occurring as they do in a region where it would not be difficult to challenge their supplies into Southern Europe. Thus Gazprom has been the high bidder in a project to float an LNG plant over the Tamar field and to liquefy that gas so that it can be sold into Asia. The goal for the start of that project is in 2017. Turning to Leviathan, which is expected to come on line in 2016, with 750 mcfd being supplied to Israel. The interesting question is what to do with the rest. 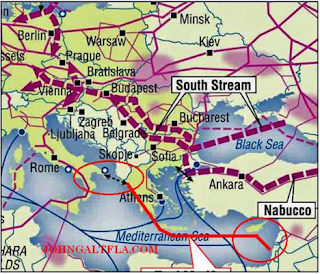 There is talk of a pipeline to run up into Turkey and thence on into Europe. This would have the advantage of further diminishing the European dependence on Gazprom and Russian gas, but there are some political problems. 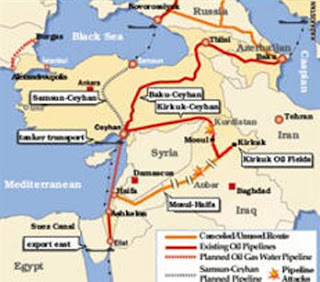 One is that the pipeline would run through the Greek controlled waters off Cyprus, another is that Turkey gets most of its natural gas from Russia and Iran, and they would be displeased. (Though it would help Turkey over the difficult problem of Iranian sanctions). When one looks at the Cyprus field, with these ramifications going on in the rest of the global gas market, it becomes a little more evident why Russia has not been willing to dash into the financial scene and bail the Cyprus economy out by buying a future stake in the Cyprus natural gas. There was an alternative proposal (H/t Gail) for the pipeline to run instead through Cypriot waters and then on up into Europe directly. 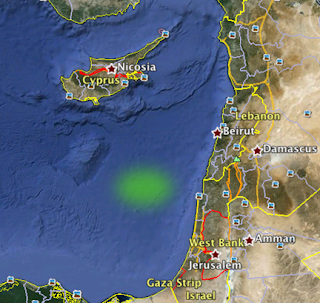 With Cyprus in a financial mess they offered their natural gas to Russia, as part of the security for immediate help. In the end Russia did not bail out the Cypriots. At the same time that Cyprus was talking to the Russians they were also talking with the European Union, and it appears that perhaps the threat of Russian control of Cypriot gas helped expedite an EU rescue move. There is, I believe, more in this for the EU than for Russia. The benefit to Russia would come more from controlling a relatively small amount of competitive natural gas, at a time when they are trying to maintain the market for their own. And while they likely did not anticipate the hit that Russian bank deposits are taking, the overall cost to them does not translate into an adequate return on the investment that they would have had to make to keep Cyprus stable. On the other hand this has benefits for the EU if it can further expand the availability of an alternate source of supply to that from Gazprom, then they can possibly lower future projected prices for natural gas. Set against which is the history of Gazprom sitting on the sidelines waiting for an investment opportunity later in the game, and then stepping in and gaining control for a lower price. It will be interesting to see how this one plays out.